The EL 42 which has won multiple awards as the world’s best binocular is perfectly suited to practically all situations with its classic 42 mm objective lens diameter. These binoculars with an exit pupil over 4 mm, perfect ergonomics and 10x magnification are popular all over the world and perfect for bird identification. 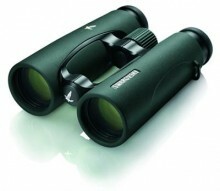 These binoculars are eminently suitable for observation in wide, open habitats, where birds tend to be further away. − Field Flattener Lenses: Allows for a razor sharp focus of an image to the extreme edges of the field of view. A completely distortion free view! Field Flattener Lenses are part of SWAROVSKI OPTIK’S SWAROVISION technology. These lenses eliminate all loss of sharpness and distortion at the edges of the binoculars field of view. Everything in the EL SWAROVISION binocular’s field of view will be razor sharp with no distortion to the extreme edges of the field of view. − HD glass: Fluoride containing HD glass allows for the truest possible color to reach the eye. This feature enhances contrast and resolution as well as virtually eliminating color fringing. − Long Eye Relief: The eye relief of the EL SWAROVISION is now 20 mm. This allows for eyeglass wearers to easily see the full field of view. The eyecups now have 3 position settings for maximum comfort for the user. • SWAROTOP anti-reflective coatings, SWARODUR scratch resistant coatings, SWAROBRIGHT mirror prism coating, have all been enhanced to improve brightness and color reproduction, especially at dusk. • SWAROCLEAN coatings are applied in a special process and affect the surface energy of the external objectives and ocular lenses so dirt, water marks, tree resin, etc. can be removed effortlessly. • Redesigned, smooth and tolerance free focus mechanism – 1 turn to go from infinity to 10 ft. Another full turn to go from 10 ft. to 4.9 ft. This new focusing mechanism allows a correction of vision of at least 6 diopters, in order to compensate for near or far sightedness. Click the button below to add the Swarovski 10x42 EL SWAROVISION Binocular to your wish list.